John Smoltz took a no-hitter into the 8th inning as the Atlanta Braves blew out the Washington Nationals as they try to keep their slim playoff chances alive. For one glorious night, John Smoltz put aside frustrations and disappointments of this Braves season and nearly accomplished something he’d never done before. The 40-year-old Braves ace shook off a head cold and came within six outs of his first no-hitter, the bid thwarted when Ronnie Belliard singled to start the eighth inning of a 7-1 win against the Washington Nationals at Turner Field. He finished with 10 strikeouts and two walks, threw 70 strikes in 109 pitches, and left with a 7-0 lead. Smoltz (13-7) was charged with a run when Belliard came around to score on Ryan Church’s double against reliever Peter Moylan. The only pitcher in major league history with at least 200 wins and 150 saves, Smoltz knows he’s probably running out of chances to join the no-hit club, but one would never know from the way he dominated on Friday. “Doesn’t surprise anyone in here, does it?” Braves manager Bobby Cox said of the performance by Smoltz, who has recovered from a sore shoulder to post 11 quality starts (six innings or more, three earned runs or fewer) in 12 games. Chipper Jones went 3-for-4 with a double and a three-run homer for the Braves, who’ve won three of four games to keep their faint playoff hopes alive. They remained in third place in the National League East, 7-1/2 games behind New York and 1-1/2 behind Philadelphia. But the Braves leap-frogged two teams (Chicago and Milwaukee) into fifth place in the wild-card standings, 4-1/2 games behind wild-card leader San Diego after the Padres lost Friday at Colorado. Smoltz had his third 10-strikeout game of the season and 43rd of his career, including five strikeouts in the first two innings. It caused his pitch count to climb faster than in most other starts this season. 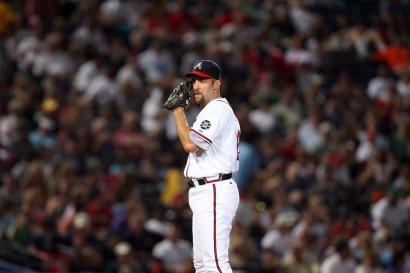 Smoltz has one complete-game one-hitter, against Cincinnati on April 30, 1999. It’s been 17 years since he came within two outs of a no-hitter at Philadelphia. There have been 14 no-hitters in franchise history, but only three since the Braves moved to Atlanta in 1966. The only no-hitter at Turner Field was Randy Johnson’s perfect game for Arizona against the Braves on May 18. 2004. 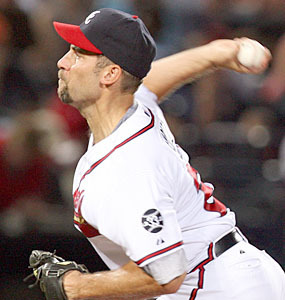 The last Braves no-hitter was Kent Mercker’s in 1994 at Los Angeles. It’s been 24 years since the only solo no-hitter by a Braves pitcher in Atlanta — Phil Niekro’s 1973 masterpiece against San Diego. Smoltz is definitely a first-ballot Hall of Famer. But, as sweet as a no-hitter would have been, the important thing at this point is just to keep winning games.